Located near Kingston, Ontario, the Amherst Island Wind Project consisted of a total of 26 turbines capable of producing 75 megawatts of generating capacity. Beginning in the spring of 2017, work involved a mainland switching station, submarine cable, transmission line, collector substation, underground collection system, municipal road upgrades, concrete foundations, turbine erection, and commissioning. 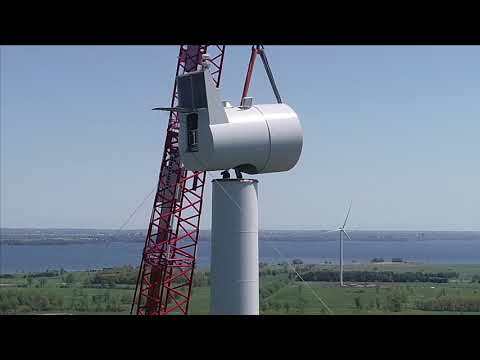 It was on May 24th, that crews successfully and safely raised the last of the 26 wind towers, marking a significant milestone for the project. Pennecon would like to thank the over 1700 people who worked on the Amherst Island Wind Project and congratulate a dedicated project team.